How To Be a Man of God: Part 2 (1 Timothy 4) | Joe Quatrone, Jr. In 1 Timothy 4, Paul emphasized the character and the work of the minister himself; and he listed three qualities he must possess if he is to be successful in serving God. In Part 1, we saw the first quality of a good minister: he preaches the Word. Today, we will look at the next quality. Have nothing to do with godless myths and old wives’ tales; rather, train yourself to be godly. 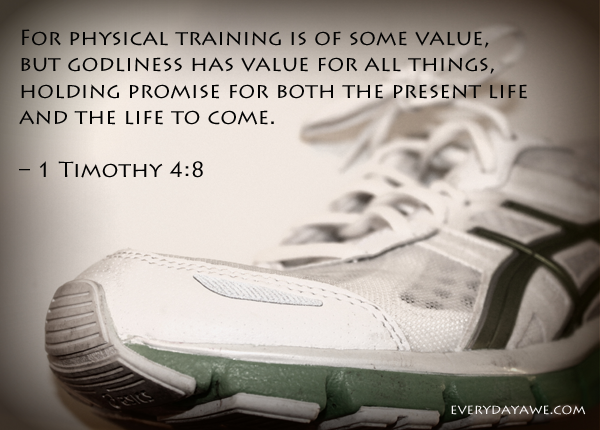 For physical training is of some value, but godliness has value for all things, holding promise for both the present life and the life to come. This is a trustworthy saying that deserves full acceptance. That is why we labor and strive, because we have put our hope in the living God, who is the Savior of all people, and especially of those who believe. Command and teach these things. 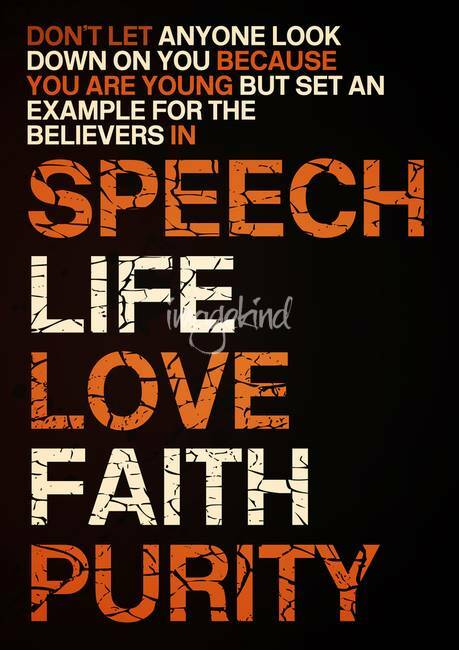 Don’t let anyone look down on you because you are young, but set an example for the believers in speech, in conduct, in love, in faith and in purity. Paul shifted to an athletic illustration at this point in his letter. Just as a Greek or Roman athlete had to refuse certain things, eat the right food, and do the right exercises, so a Christian should practice “spiritual exercise.” If a Christian puts as much energy and discipline into his spiritual life as an athlete does into his game, the Christian grows faster and accomplishes much more for God. Paul discussed in this section three levels of life. The bad—“godless myths and old wives’ tales” (v. 7a). These are, of course, the false teachings and traditions of the apostates. These doctrines have no basis in Scripture; in fact, they contradict the Word of God. They are the kind of teachings silly people would discuss, not dedicated men and women of the Word! No doubt these teachings involved the false doctrines just named (vv. 2-3). Paul also warned Titus about “Jewish myths” (Titus 1:14). Paul warned Timothy about these same “myths” in his second letter (2 Tim. 4:4). A believer cannot rediscover new doctrines. Paul admonished Timothy to remain true to “the good doctrine which you have closely followed up to now” (1 Tim. 4:6). He warned him not to “give heed to myths and endless genealogies” (1 Tim. 1:4). While a pastor must know what the enemy is teaching, he must not be influenced by it. A chemist may handle and study poisons, but he does not permit them to get into his system. The temporary—“bodily exercise” (vv. 7–8). Again, this is an athletic image. Certainly, we ought to care for our bodies and exercise is a part of that care. Our bodies are God’s temples, to be used for His glory (1 Cor. 6:19–20) and tools for His service (Rom. 12:1–2). But bodily exercise benefits us only during this life; godly exercise is profitable now and for eternity. Paul did not ask Timothy to choose between the two; the Lord expects us to practice both. A healthy body can be used of God, but we must major on holiness. Are you in shape both physically and spiritually? In our society, much emphasis is placed on physical fitness, but spiritual health (godliness) is even more important. Our physical health is susceptible to disease and injury, but faith can sustain us through these tragedies. 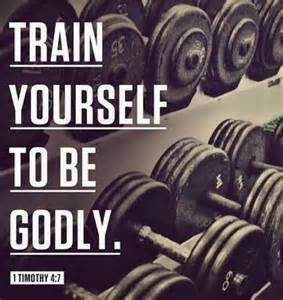 To train ourselves to be godly, we must develop our faith and use our God-given abilities for His service. Are you developing your spiritual muscles? The eternal—“godliness” (vv. 9–12). Godly character and conduct are far more important than golf trophies or home-run records, though it is possible for a person to have both. Paul challenged Timothy to be as devoted to godliness as an athlete is to his sport. We are living and laboring for eternity. Paul used two similar athletic images in writing to the Corinthians (1 Cor. 9:24–27), emphasizing the disciplines necessary for godly living. As an athlete must control his body and obey the rules, so a Christian must make his body his servant and not his master. When I see high school football squads and baseball teams going through their calisthenics under the hot summer sun, I am reminded there are spiritual exercises I ought to be doing (Heb. 5:14). Prayer, meditation, self-examination, fellowship, service, sacrifice, submission to the will of others, witness—all of these can assist me, through the Spirit, to become a more godly person. Spiritual exercise is not easy; we must “labor and strive.” The word translated “strive” is an athletic word from which we get our English word agonize. It is the picture of an athlete straining and giving his best to win. A Christian who wants to excel must really work at it, by the grace of God and to the glory of God. Timothy was a young pastor. It would have been easy for older Christians to look down on him because of his youth. He had to earn the respect of his elders by setting an example in the way he lived. Exercising ourselves in godly living is not only profitable for us; it is also profitable for others. It enables us to be good examples, so they can see Christ in us and we can encourage them. Paul named several areas of life in which you and I should be examples. 1. In speech implies our words should always be honest and loving, “speaking the truth in love” (Eph. 4:15). 2. In conduct suggests our lives are to be controlled by the Word of God. We must not be like the hypocrites Paul described to Titus: “They claim to know God, but by their actions they deny Him” (Titus 1:16). 3. In love points to the motivation of our lives. We do not obey God to be applauded by men (Matt. 6:1), but because we love God and love God’s people. 4. In faith implies we trust God and are faithful to Him. Faith and love often go together (1 Tim. 1:14; 2:15; 6:11; 2 Tim. 1:13; 2:22). Faith always leads to faithfulness. 5. In purity is important as we live in this present evil world. Ephesus was a center for sexual impurity and the young man Timothy was faced with temptations. He must have a chaste relationship to the women in the church (1 Tim. 5:2) and keep himself pure in mind, heart, and body. The title “Savior of all men” does not imply everybody will be saved (universalism) or that God saves people in spite of themselves; for Paul added “especially of those who believe.” It is faith that saves one’s soul (Eph. 2:8–10). Since God “wants all people to be saved” (1 Tim. 2:4) and since Christ “gave Himself as a ransom for all” (1 Tim. 2:6), then any lost sinner can trust Christ and be saved. Christ is “the Savior of all people,” so nobody need despair. Timothy should not fear to practice the Word of God and apply it to the life of the church, for this Word “is a trustworthy saying that deserves full acceptance” (1 Tim. 4:9). These faithful sayings made up a summary of truth for the early church (1 Tim. 1:15; 3:1; 2 Tim. 2:11; Titus 3:8). The fact Timothy was a young man (the word then applied to a person from youth to forty) should not deter him from practicing the Word. In fact, he was to “command” these things and this is our military word “charge” (1 Tim. 1:3). The local church is a unit in God’s spiritual army and its leaders are to pass God’s orders along to the people with authority and conviction. In Part 3, we will see the godly minister not only practices the Word, but progresses in the Word. 1. What part does self-discipline play in true spirituality? How important is self-discipline in your life? 2. Why is it important that leaders set a good example? Is this something confined only to those in leadership or should all Christians be setting an example to other people? 3. Imagine your friend is living in a way that is inconsistent with God’s Word. Should you speak to him about the way his witness is being undermined by his conduct. If so, what would you say? This entry was posted in Book of 1 Timothy and tagged Excercise, Faith, Godly, Leadership, Love, minister, Pastor, Servant, Speech. Bookmark the permalink. Pingback: How To Be a Man of God (1 Timothy 4) | Pastor Joe Quatrone, Jr. Thanks for the tip. Charles Stanley is my favorite writer. God bless! Thanks for sharing this on your blog, my friend. God bless! Thanks for sharing this on your blog, Vince. God bless! You’re welcome Pastor Joe! Lord bless you too. Thanks for sharing this on your blog. God bless! Thanks for sharing this on your blog, Jim. God bless! Pingback: How To Be a Man of God: Part 3 (1 Timothy 4) | Pastor Joe Quatrone, Jr.
Wow, this is very thought-provoking and inspiring! Just ask my husband Dave, what his golf trophies mean to him as he looks back now as a new pastor. God’s awards trump man’s awards any day! Thank you for this post. Absolutely! Thanks Ellie! God bless! I’m at the same place that Paul was (see below ) at one time in his Christian journey but I know as I aim to be perfected in Love, I too like him will receive the Crown. Philippians 3:12-14 Not that I have already obtained all this, or have already been made Perfect, but I press on to take hold of that for which Christ Jesus took hold of me. Brothers, I do not consider myself yet to have taken hold of it. But one thing I do: Forgetting what is behind and straining toward what is ahead, I press on toward the goal to win the prize for which God has called me Heavenward in Christ Jesus. 2 Timothy 4:7-8 I have fought the good fight, I have finished the race, I have kept the Faith. Now there is in store for me the Crown of Righteousness, which the Lord, the Righteous Judge, will award to me on that day and not only to me, but also to all who have longed for His appearing. Amen! Philippians 3:12-14 is my favorite Scripture!